Vernon and I made a mad dash in and out of Otter Creek Canyon… draining a pipeline before it freezes. Fall colors have definitely taken over the canyon. I had planned to take tons of photos, but we were buzzing in fast on the four wheeler at 6 pm, so those that weren’t exposed right for fading sun and shadow, were fairly blurry! Then halfway down the canyon, I decide to turn my camera off to save on battery. My camera refused to retract the lens and close, but it kept powering off. The big first sign that this camera, too, is not going to hold up to my life! I had just started to consider buying another, and just take this one on the dusty rough cowboyin’ days… and save a good one for “cleaner” days. This one, though, I think I’ll tear apart and see if I can clean it. I probably can’t, but this is ridiculous and if I’m having to buy a new one, I don’t have anything to lose! Can anyone remember when I bought this? I’ll have to go back and check… wasn’t it just January? Canon, I’m disappointed… I thought it’d last a year at least! I did manage to encourage it back to life… and took a few good pics. 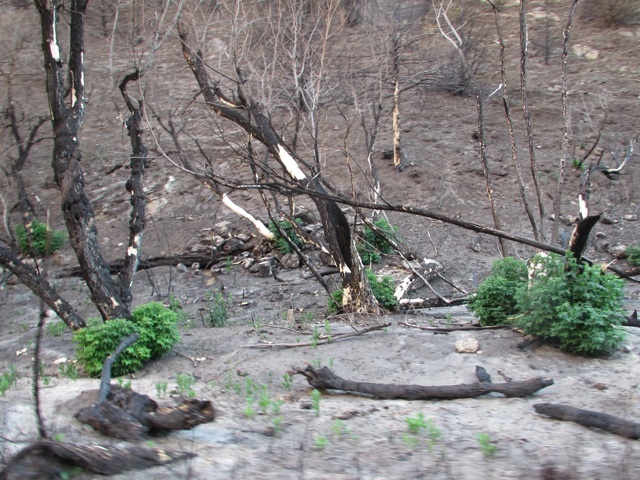 This was the first time I’d been in the canyon since the wildfire… and I was happy to see the boxelder trees have some good regrowth going on next to the creek!